A data set of observed daily and monthly averaged precipitation, maximum and minimum temperature, gridded to a 1/16° (~6km) resolution that spans the entire country of Mexico, the conterminous U.S. (CONUS), and regions of Canada south of 53º N for the period 1950-2013. The dataset improves previous products in spatial extent, orographic precipitation adjustment over Mexico and parts of Canada, and reduction of transboundary discontinuities. The precipitation is adjusted for orographic effects using an elevation-aware 1981-2010 precipitation climatology. Because of the consistent gridding methodology, the current product reduces transboundary discontinuities making it suitable for estimating large-scale hydrometeorologic phenomena. Also included are daily wind data from the National Centers for Environmental Prediction - National Centers for Atmospheric Research (NCEP - NCAR) resampled to the same grid as temperature and precipitation. Hydrometeorological states and fluxes are simulated over the full period 1950-2013 using the Variabile Infiltration Capacity (VIC) model v.4.1.2.c. The complete data set including gridded meteorology and VIC simulated hydrometeorology hosted here at the Lawrence Livermore National Laboratory server. The gridded meteorology only is hosted here by the National Centers for Environmental Information. If you use these data, please cite: Livneh B., T.J. Bohn, D.S. Pierce, F. Munoz-Ariola, B. Nijssen, R. Vose, D. Cayan, and L.D. 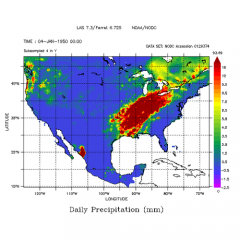 Brekke, 2015: A spatially comprehensive, hydrometeorological data set for Mexico, the U.S., and southern Canada 1950-2013, Nature Scientific Data, 5:150042, doi:10.1038/sdata.2015.42.